Happy Monday friends!! Coming off a 4 day weekend is always hard, but the memories made will certainly get us all through Monday and if that doesn't help then another short week should do the trick! Gary and I spent Christmas Eve at my sister's house and seriously ate more than I care to admit, but that's what Holiday's are for right!? An abundance of food, lots of family time & lobster mac & cheese - quite possibly two of my favorite things in the world! We had a super low key, but perfect Christmas day! A breakfast quiche was quickly followed by a run - since it was close to 65 degrees!! Our version of a perfect Christmas dinner - sushi and Gary convinced me to go see Star Wars - and can I just say, very pleasantly surprised!! It was awesome! 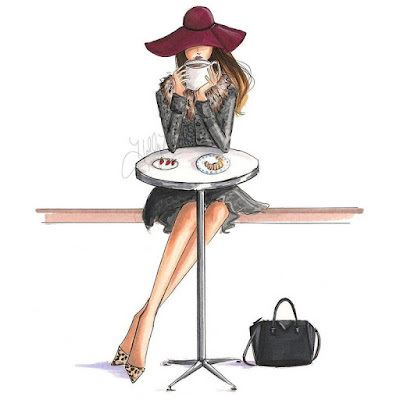 There is something so relaxing about having a latte & planning goals for the coming year!! 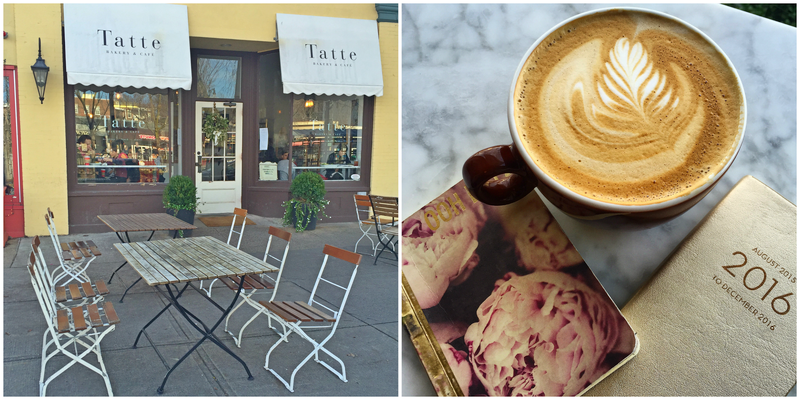 My favorite place to do that - Tatte Bakery! Saturday night, Meg & her husband were in town and we were able to meet up for dinner! It was so nice of them to stop in while they were around the area and of course we never pass up an opportunity to check out a new to us restaurant!! Legal Crossing is another part of the Legal Seafood chain, but slightly different menu. 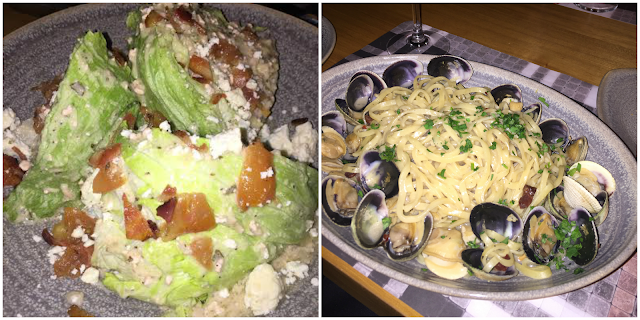 We split the wedge salad, my favorite & the linguine with three different types of clams - YUM! After saying goodbye to Meg & Mike we made our way to see the show Once. The show was hands down the best performance I've ever seen! The cast was all so talented & having not known anything about the background - we could not have had a better time! You can listen to some of the songs here, but my favorite was Falling Slowly! 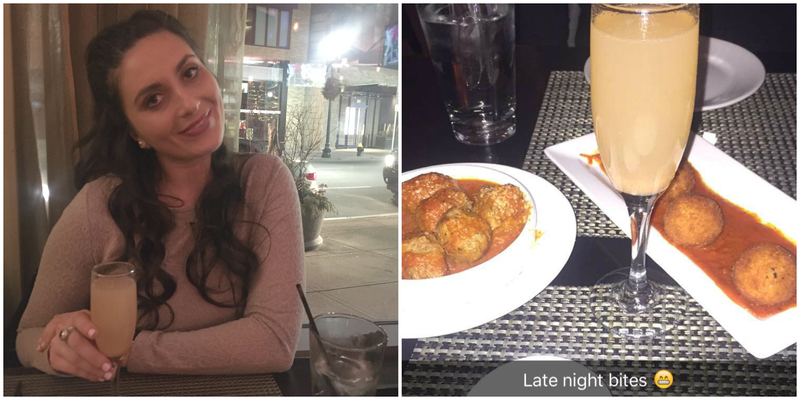 After the show we were both a little hungry so we went around the corner to one of our favorite places - Sip Wine Bar & Kitchen and if you're ever in town, please stop on to have the mini arancini & mini kobe meatballs...so good! 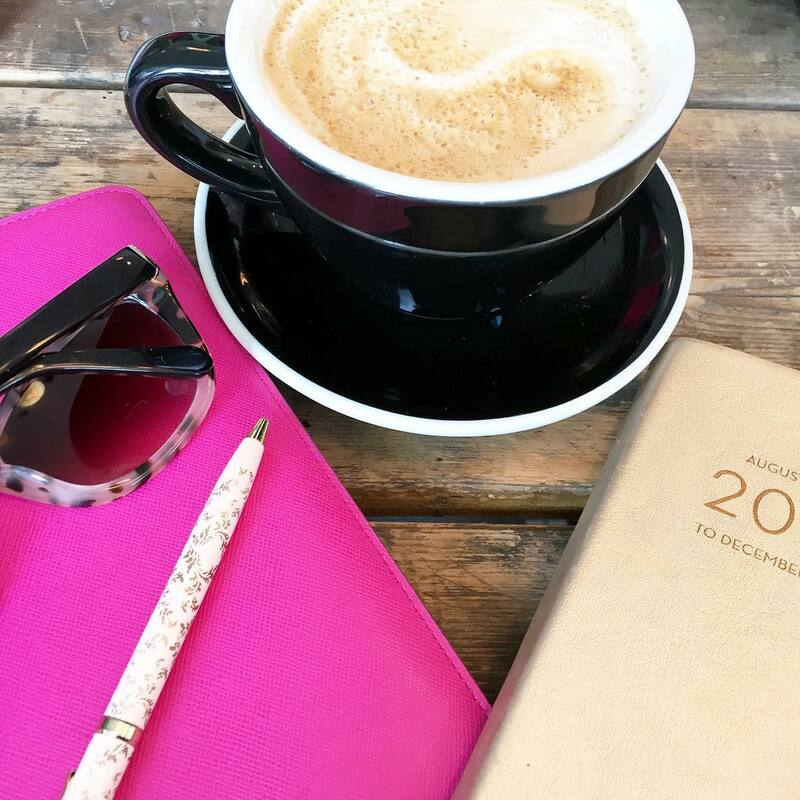 Sunday was spent prepping for the week to come and 2016!! I'm so excited for the New Year and new things to come!! How was your holiday weekend? 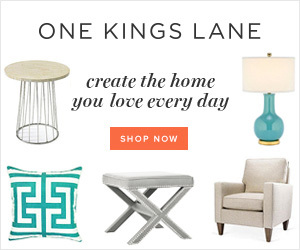 Link up below to share! What a fun weekend! Looks like you had such a great time. I'm also excited that this week is another short week.. though I wish I had taken off today! Have a great Monday! I ate too much this weekend, too. I felt a little bad yesterday, then I realized it's a holiday, duh, so of course I ate too much. That drink looks yummy, and is that a table full of brussel sprouts. Yummm. Looks like it was a wonderful Christmas weekend!! Went with husband to see Star Wars too and was surprised at how much I liked it. Perfect Christmas dinner to me..sushi!!! Loving those burgundy pants you're wearing at you sisters. Such cute outfit. I've been working on planning for 2016 too, seems like I just was working on 2015!! I have a feeling it's going to be a great year for you! ;-) gorgeous!!! What a great Christmas weekend! I would have loved to eat sushi for Christmas dinner! Omg isn't Once so good! Your Christmas sounds amazing! I just love all the festive photos. What kind of watch is that? I'm loving the pink band! I think we all ate a lot for Christmas. Whoops! Looks like you had a wonderful weekend! What a fun but busy weekend! Love the outfit you wore to the show--"Once" has AMAZING music! "Falling slowly" is my favorite too! Sounds like such a great holiday weekend! Sounds like such a fun weekend! That wedge salad looks so yummy! Fabulous Christmas! I'm off today but picking up the aftermath haha! Happy Monday!!!! Looks like you had the best last weekend of the year. All the yummy goodness too, oh my. I Love your Christmas outfit and the star on top of the tree. So glad to hear you had such a nice holiday and that Star Wars was good lol. I've never seen any of the other ones but I hear it doesn't make a huge difference? Yeah for bloggers visiting! Always a great excuse to try out new fun places. After everything I ate myself this weekend I wouldn't think my mouth would be watering at your pics - but it is! I want to make lobster mac & cheese SO BAD but I feel like I may never be anything but majorly over weight if I do that, lol! So glad you had such a great holiday weekend, doll! It looks like you had a lovely Christmas! The weather was incredible, wasn't it? We were talking about getting tickets to Once, but we never did. That coffee looks divine. We're always looking for new places to find good coffee. Thanks for the link. :-) Have a great week! It sounds like you had an amazing Christmas weekend with lots of family time! The lobster mac 'n cheese sounds amazing, and it looks like you had your favorite meal for Christmas day, sushi! I'm so glad that you liked Once! We saw it in NYC a few years ago, and immediately fell in love with the show! The cast is so talented, and the music is fantastic. Whatever you do, don't watch the movie! It's an indie film, and the Broadway show is so much better done than the movie was. Glad you had a fantastic Christmas weekend! Looks like you had such a lovely holiday filled with lots of festivities! 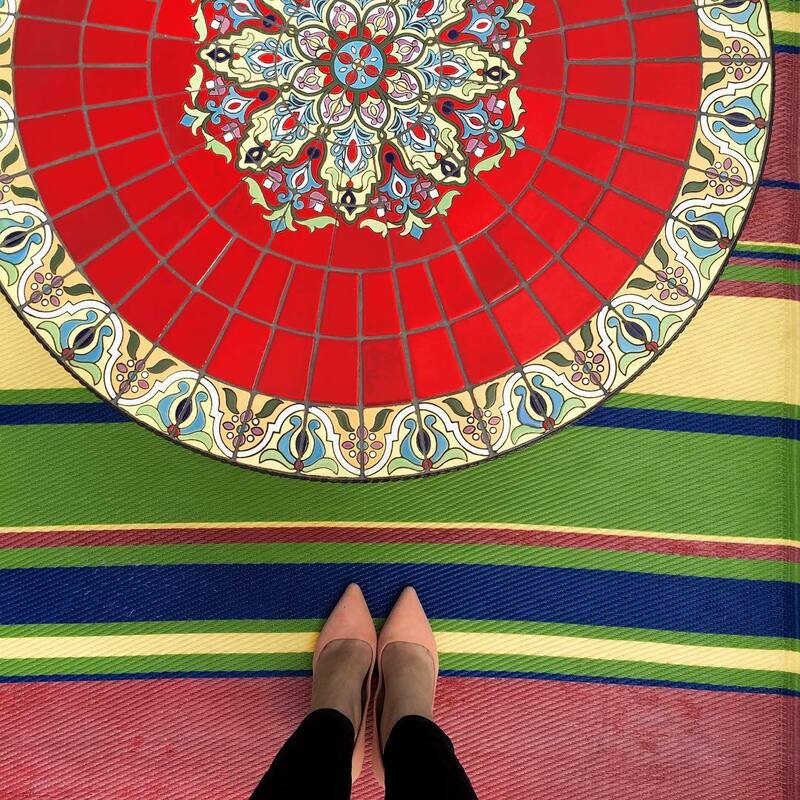 Great photos and it looks like you got some great gifts too :) Thank you for sharing! Your Christmas looked like you had so much fun and great family time! Christmas dinner looks yummy, and love that y'all went to the movies that night! I've always wanted to go to the movies on Christmas day but we have too many family things to attend. I was scrolling through your pics early this morning when I linked up and drooling over the food! Looks like you had a fabulous holiday. Cheers to a short week! Such a fun long weekend! I spent all weekend eating more than I care to talk about, so don't feel bad! Omg this has to be such a fun and fabulous weekend! I literally died when I saw those brussel sprouts! And how lucky are you that you got an apple watch! So Fabulous! Fab pictures! Tyler is trying to get me to go see Star Wars too haha. We are planning on waiting until the excitement dies down a little! 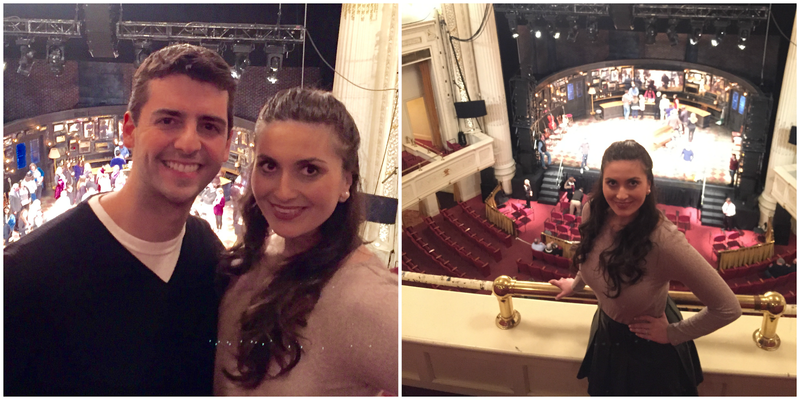 Sooooo nice to spend time with you this weekend, and I'm glad the show was so great! I love arancini, so next time I'm in town, I need to try that place! 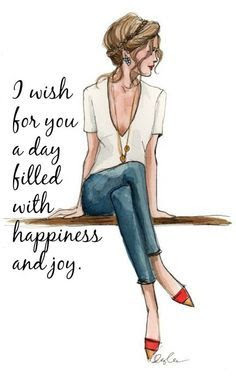 Have a great week, lady! I think seeing Star Wars on Christmas was the place to be! I love you all went for a run on Christmas... that's how you enjoy all that food! Gorgeous girlfriend! Love your Christmas Eve look and that apple watch! Hope you have a great week! I am in LOVE with your Christmas Eve outfit and the outfit at the theater! So cute! Hope you have a great week in preparation for NYE! Looks like you had a wonderful Christmas and long weekend!! I love your casual Christmas. We actually got Chinese delivery for Christmas dinner last year and I have to say it was kind of fun!! You hair half way up is perfection! You look gorgeous! (as always!) Happy Monday! Looks like you have an amazing holiday!!! Hope you have a fabulous New Years as well!!! Looks like a wonderful Christmas weekend!! I've always wanted to see Once- it looks fabulous! And I love the peplum top you wore for Christmas Eve- so cute! Love all your pictures!! What a great Christmas and weekend! I have never heard of once - I need to look into that. All the food looks sooo yummy. While eating it is so, so good, I feel like I need to do a little detoxing now! Seems like your had such an amazing time! Wish you all the best in 2016! So glad you had such a wonderful Christmas! That dish with the clams looks so yummy! sounds like such an amazing show!! I love a good musical! Calories totally don't count on Christmas! WOW seems like you had a fantastic weekend! And the food looks so darn yummy! It looks like you had a great holiday! What a great holiday! All the food looks so delicious, and your hair in the last photos is so pretty! I consumed my weight in food and cookies this weekend, so you're not alone. :) I'm glad you had such a great holiday, and how fun that you got to see the live production of Once! That's one of my favorite movies/soundtracks, so I'm sure it was amazing. Happy Monday! A weekend full of yummy food - what's better than that! Glad you had such a nice holiday. Delicious holiday weekend!! Your sister's spread looked amazing! What is that watch you got? Where did you get that black top you're wearing in your Christmas Eve photos?! It's seriously so CUTE!!! I've never heard of the play "Once," I'm really intrigued. Your hair looks so cute hair up like that. You should totally do it more! Hope you had a lovely Christmas! Ahhhh! I love the movie, Once! I'd love to see the show too because I LOVE the soundtrack. I used to play Falling Slowly on repeat. Glad you had a great Christmas! The lobster mac n cheese sounds amazing! You're going to laugh - we ate at my parents' on Christmas eve and then were back at our new house (moving stuff) on Christmas day and I'm pretty sure that I heated up a sausage in the microwave for dinner. Haha! Love that you guys had sushi on Christmas - I would expect nothing less! ;) Looks like it was a fabulous weekend, hope your Monday isn't too rough today! Everyone knows that calories don't count on holidays duh! HAH. We had Chinese both on Christmas eve and Christmas day. Anyway did you like the star wars movie? And what did Gary get you? That looks like an Apple watch? Fancy. I love that you had sushi for Christmas dinner! I would love to see Once--I saw the original movie when it came out, and the soundtrack remains one of my all time favorites! I love the black peplum top you wore! Sushi is my kind of Christmas dinner! what a great long holiday weekend! i love that y'all had sushi on christmas and don't hate that in the least! yay for family time too. and that apple watch! jealous! :) at least we have a short week, right? That cocktail in your Christmas pics looks delicious! Sushi for Christmas Dinner? Well that's different, but sounds like the best idea every. Love your low-key Christmas and I'm glad Star Wars was a good surprise for you! That pasta & those meatballs look amazing. A run, or 10, is definitely in my near future lol. I'm glad that you had a great holiday weekend! Sounds like it was such a great long, holiday weekend! The weather was so crazy, it didn't even seem like Christmas! All this food looks amazing!! omg i love Once--I've only seen the movie, but it is a fave. I can only imagine how great it was live. 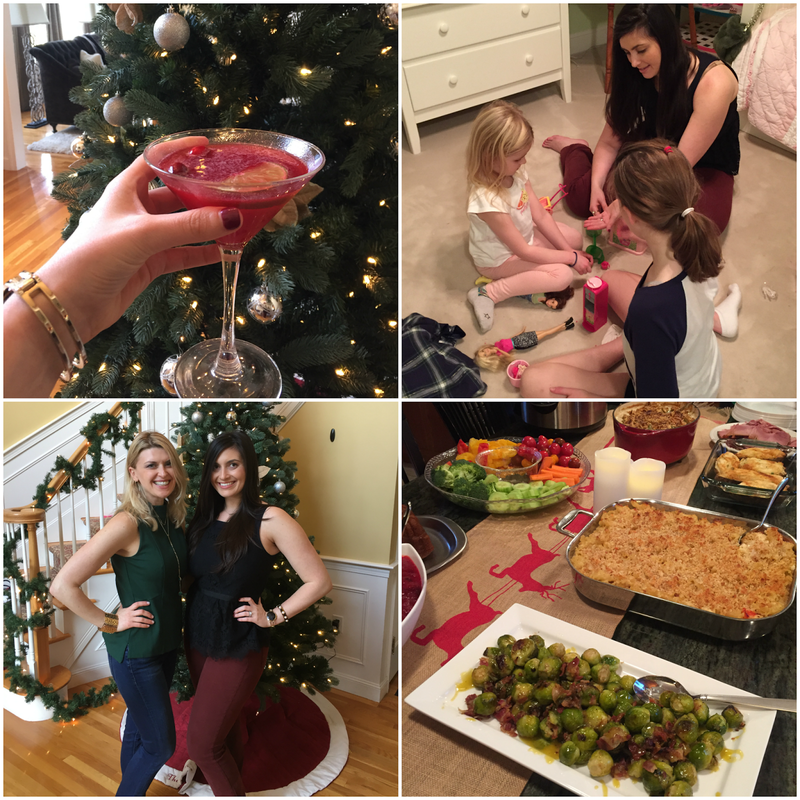 Christmas Eve at your sister's looks so fabulous - I love that you guys celebrated full out all day like that! YUM, the lobster mac!! I really love that you guys spent Christmas day just the two of you - so sweet and special and I'd love one like that! So much fun! Calories totally don't count over Christmas. And New Year's for that matter. :) Love Tatte and that you got to see Meg! 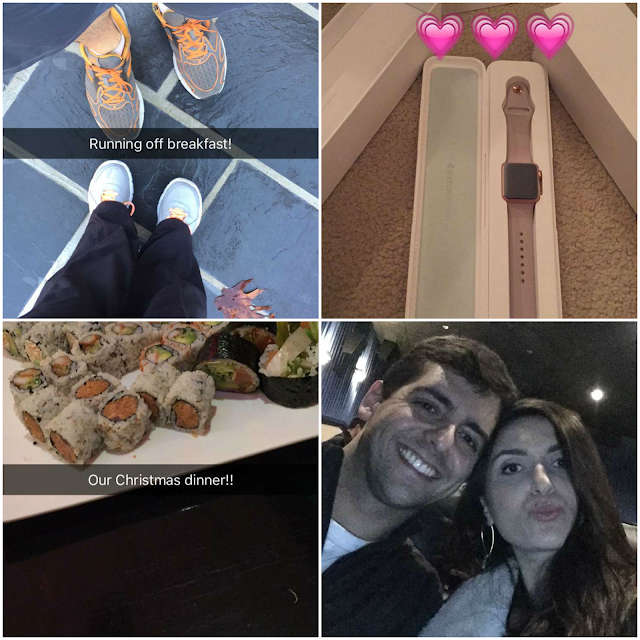 Girl...all the food you were putting on Snapchat was making me seriously jealous! It all looked so delicious! So glad y'all had a Merry Christmas! If sushi had been open we would have totally had that on Christmas as well. What a fun weekend you had! I always love seeing all the food pics, haha! Slowly catching up on my favorite blogs! Looks like you had a wonderful Christmas, I'm glad you did. I'm so sad it's all over...sigh.